In addition to taking 15 lessons of Japanese a week, you will be able to take 4 classes of Traditional Culture. ※■■parts are all included in the fee. ・Tea ceremony, flower arrangement, calligraphy, karate, sweets baking, sushi making…Twice a week discover Japanese traditional culture. 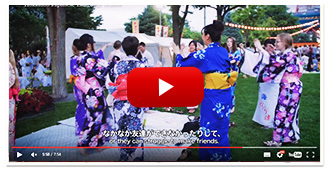 ・In addition to cultural activities, try the other ones !